We’re excited to announce our new partnership with Airbnb. From July 1 - August 30, 2016, you can sign up to become a new host and get a $200 referral bonus, plus get $200 for The Mountaineers! Summer is the busiest time for travelers. In fact, 400% more people make trips to the northwest from July-October than during winter. All those travelers will be looking for a place to stay so they can enjoy the beauty and wonder that is the Pacific Northwest, which makes right now a great time to earn extra money and connect with outdoors-minded guests by sharing your space on Airbnb. That's why we're excited to announce our new partnership with Airbnb, which benefits you and The Mountaineers. From July 1 to August 31, 2016, if you sign up as a new Airbnb host and complete a booking by October 31, 2016, you will get a $200 new host referral bonus! 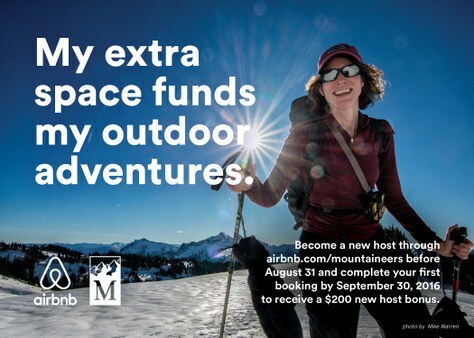 And The Mountaineers will get $200 donated to us from Airbnb, too. Airbnb numbers show hosts in the Pacific Northwest earn more per night in summer than any other season! Sign up as a host to list your property using our special Airbnb Mountaineers link. Click on Start Hosting and fill out your host profile to include at least 25 words about yourself. List your property for $75 or more per night, excluding cleaning fees and taxes. You'll need to keep listing active for a minimum of thirty (30) days after activation. Be sure to include at least 50 words in the listing description and upload five high quality photos. Complete the Verified ID process. After completing your listing, you will need to accept at least one reservation by October 31, 2016. If you sign up and do not ever host a guest, you will not qualify. And if you sign up and deactivate your account within 30 days, regardless of if you've hosted or not, you will not qualify. “I’m an early adopter of Airbnb and have used the platform to book dozens of business and leisure travel trips over the years – some were single rooms while others were entire homes or apartments. In fact, just in the last week, I’ve booked two apartments on Airbnb for various summer travel to Vancouver, B.C. and Deception Pass. I rent on Airbnb because I love the personalization and home-like feel that someone’s personal space provides me. When I stay at hotels, I often don’t use the pools, gyms, saunas and other luxury amenities they offer so I bypass paying the extra money when I can. I've only ever had positive experiences with Airbnb, and while a new baby at home prevents me from hosting myself, I was thrilled when Airbnb created this offer for The Mountaineers. They're rewarding our community with additional funds we can use to get more people outside. I hope you’ll consider helping out other travelers like me by renting out your extra space on Airbnb!" Qualifying hosts will receive a $200 referral bonus to the Airbnb host account for new Seattle listings and $250CAD referral bonus to the Airbnb host account for new Vancouver, BC Listings. Seattle/Tacoma Zip Code Eligibility: This offer is valid only for new Airbnb listings in the following Seattle/Tacoma zip codes: 98001, 98002, 98003, 98004, 98005, 98006, 98007, 98008, 98011, 98012, 98019, 98020, 98021, 98023, 98024, 98026, 98027, 98028, 98029, 98030, 98031, 98032, 98033, 98034, 98036, 98037, 98038, 98039, 98040, 98042, 98043, 98045, 98052, 98053, 98055, 98056, 98057, 98058, 98059, 98065, 98070, 98074, 98075, 98077, 98087, 98092, 98101, 98102, 98103, 98104, 98105, 98106, 98107, 98108, 98109, 98110, 98112, 98115, 98116, 98117, 98118, 98119, 98121, 98122, 98125, 98126, 98133, 98134, 98136, 98144, 98146, 98148, 98155, 98166, 98168, 98177, 98178, 98188, 98198, 98199, 98203, 98204, 98208, 98236, 98272, 98275, 98290, 98296, 98310, 98311, 98312, 98329, 98332, 98335, 98337, 98340, 98342, 98345, 98346, 98365, 98366, 98367, 98370, 98376, 98380, 98383, 98392, 98402, 98403, 98405, 98407, 98422, and 98424. Vancouver, BC Zip Code Eligibility: This offer is valid for new Airbnb listings in Vancouver postal codes within 40.23km of Vancouver City Centre Train Station, located at 701 W Georgia St, Vancouver, BC V7Y 1G5. Airbnb listings in valid zip codes must be created by new Hosts between June 1, 2016 and August 31, 2016. To qualify for the referral bonus, the New Listing must be new and not previously activated or duplicated from another Airbnb listing, and it must be associated with a Host who has never hosted on Airbnb previously. Reservations of your New Listing made by a friend, family member or any member of your household will not be counted as Qualifying Reservations and will not be eligible for the $200 referral bonus. If you qualify for the referral bonus, you will receive the referral bonus no later than December 30, 2016 to the payout method set on your account. Determinations of eligibility for this offer will be made in Airbnb's sole discretion. Airbnb reserves the right to any remedy, including denial of the Additional Payment or cancellation of your account or reservations, if fraud, tampering, violations of Airbnb's Terms of Service or technical errors are suspected. This offer cannot be combined with any other offer or promotion. Too bad it's only for new AirBnB hosts. I've rented out our guestroom many times over the past several years.